Phineas and Ferb has endeared children and parents alike since it popped up on the Disney Channel in 2007. Since its inception, the show has also garnered generally favorable reviews from critics and is known for its special episodes as well as its use of original songs from time to time. 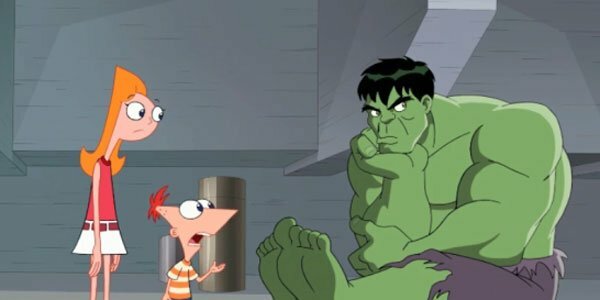 Since Phineas and Ferb is a fan of trying new things on television and Disney now owns Marvel, someone had the brilliant idea to do a Phineas and Ferb: Mission Marvel crossover special and on Sunday, fans got a first look at upcoming TV event. In the preview, Phineas and Candace all take a look at some of Marvel’s finest after something goes wrong. Apparently, the superheroes have all accidentally exchanged powers, and while this is great for some of the superheroes, for others it's kind of a pain in the rear. As Phineas dryly notes, there’s not much Hulk can do with Iron Man’s powers, at least without the suit. The 90-second preview is full of witty one-liners like this, and it stands to reason that some Marvel fans—especially those with kids—will traipse over to Disney to catch the crossover when it airs. According to USA Today, the overarching premise of the episode will follow Phineas, Ferb and the rest of the gang as they team up with Spider-man as well as members of The Avengers in order to fight to save Danville from imminent evil and destruction. In tune with the Marvel theme of the episode, bad guys like Red Skull, Whiplash, Venom and M.O.D.O.K. will all show up in town. They will be aided by the resident Phineas and Ferb bad guy, Dr. Doofenshmirtz. While the silver screen actors who portray the Marvel characters won’t be offering voicework during the episode, some famous names have still signed on to appear in Mission Marvel. These include Adrian Pasdar, Chi McBride, Danny Trejo, and Drake Bell. The crossover TV special will premiere on Friday, August 16 at 8 p.m. ET on the Disney Channel. That is a weekend night, but luckily, if you are the type of person to invest in this crossover project, you are probably not the type of person to be out on a Friday night, anyway. If you do have plans, there is always DVR. In the meantime, you can catch Phineas and Ferb at Comic Con this year.